As paddleboarding surges in popularity, it looks like it could soon replace the canoe as the defacto mode of transport for weekend camping excursions. A company called Coreban has teamed up with celebrity outdoorsmen Bear Grylls to create the Ultimate Adventure Tent: an inflatable paddleboard that gets you to your campsite and gives you a comfy place to sleep once you're there. 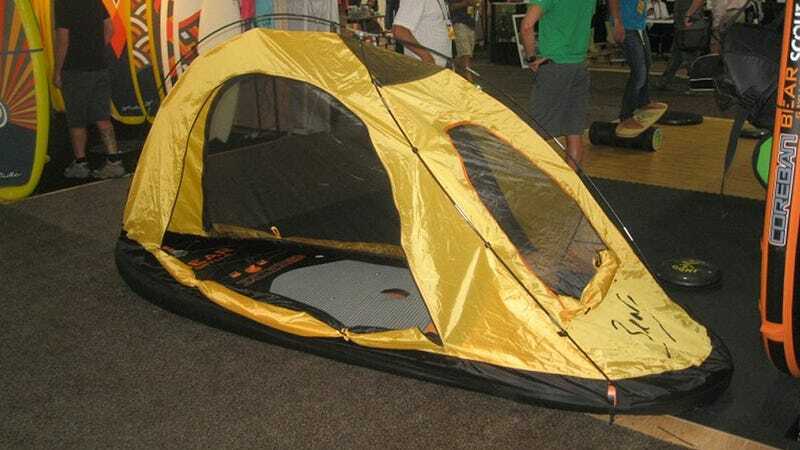 The tent only has enough room to sleep one person, but it's not like you carry passengers on a stand up paddleboard anyways. It does, however, come with extra rigging for securing packs and other containers, and even a dry bag for protecting food and other gear while you're on the water.